I take my work home with me. I have been instructing Cause Mapping and facilitating issues for nearly 14 years, so my kids have grown up observing this methodology. In fact, you could say that problem solving is one of our core family values. So, when my son Ben was having difficulty working with us to solve a recurring issue, the natural next step was to build out a Cause Map. Cause Mapping objectively looks at cause-and-effect relationships and does not focus on placing blame on any members. The key is for the facilitator (and other team members) to objectively look at the causes and address them with specific solutions. Ben is 18 and has generously agreed to let me use his case as the subject for this blog. He is an all-around great kid but, he has had extreme difficulty waking up in time for school. This has been an issue Ben has struggled with for several years. Last school year he racked up a stunning 52 tardies. Once his senior year arrived, the problem reared its ugly head again. Within the first four weeks of school he had already accrued several tardies due to oversleeping. We were exhausted from trying to solve this problem – we had tried so many things (sonic boom alarms, vibrating systems under his pillow, his little sister yelling at him, his mom waking him up before she went to work) finally we decided it was time to develop a Cause Map. Building a Cause Map together allowed us to have a more constructive dialogue with my son regarding a very irritating trait/behavior. Individual or Organizational Behaviors are some of the most difficult to address in any problem-solving situation. Oftentimes the Million Dollar Technical Solution is far easier to implement than changing individual or organization behaviors. Changing behaviors requires recognizing the issue and being open to different Solutions. Multiple solutions are often required to influence behavior changes/improvements. We initially built the Cause Map on 13-September with a CEO (my wife) review on 15-September. We are also using the Solutions Ranking Matrix in this example. The purpose of the Matrix is to provide a relative value of specific solutions. It must be used with the Cause Map graphic as the matrix is not goal specific. The horizontal axis represents a determination of the difficulty of implementing the specific solution. 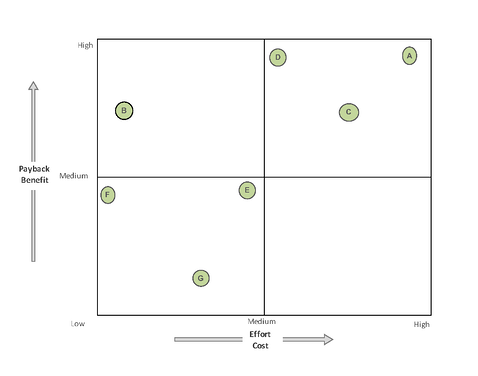 The vertical axis represents the expected benefit or risk reduction from a specific solution. These are qualitative measures using language such as low-medium-high. We have found the Solutions Ranking Matrix valuable in the management discussion and final conclusion of the Cause Mapping project. Ben helped develop and rank these Solutions/action items. He has effectively signed off on these action items without hesitation. I would love to say that the Cause Map made the undesirable behavior disappear magically into the air. We all know it’s never that simple. The number of tardies he has accrued since creating the map has decreased by 80% compared to last year at this time. He still has trouble sleeping. He still procrastinates. But the action items are being implemented. Improvement is happening. The biggest change in this dynamic is not quantitative. The “us” and “them” atmosphere that had built up over time instantly changed to one of a team working together to solve an issue. Organizations that adopt the Cause Mapping process as part of their culture can also experience this kind of change. It is the graphic nature and problem-solving focus of the methodology that makes this a powerful tool to affect a change in employee behavior. Unlike other processes which seek to punish undesirable behavior, Cause Mapping brings all the people involved to the table for constructive dialogue. For additional light reading, Ben referenced this article to justify his unorthodox sleep patterns. Interested in Cause Mapping incidents that occur every day? 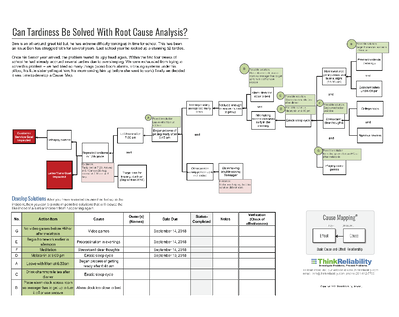 Check out our two-hour 5-Why Cause Mapping Root Cause Analysis Online Short Course for an in-depth discussion on the 5-Why Cause Mapping Method.